Doodle Thinking is a natural process of creative thinking and a way to improve your capability to think and communicate. It enables you to draw what your creative side imagines and connect back to what your logical side thinks. 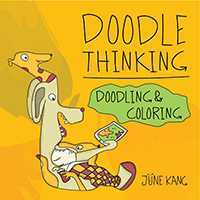 Doodle Thinking helps you build your creative muscles and be more comfortable with ambiguity. The book consists of a total of 56 doodling and coloring pages – 28 random shape challenges and 28 creative doodles on a random shape based on inspiration from my parenthood journey. See how the simple act of Doodle Thinking can unlock creativity.